But my favorite part are the branches that stand out against the moonlight decorated by their leaves, divine in their autumn colors! A true masterpiece! Compliments! Congratulations! You won the first place in my contest "12 contests for 12 months: October"! First of all because in your doll there are many aspects for me the most representative of October! Secondly because I love the elegance of your style! 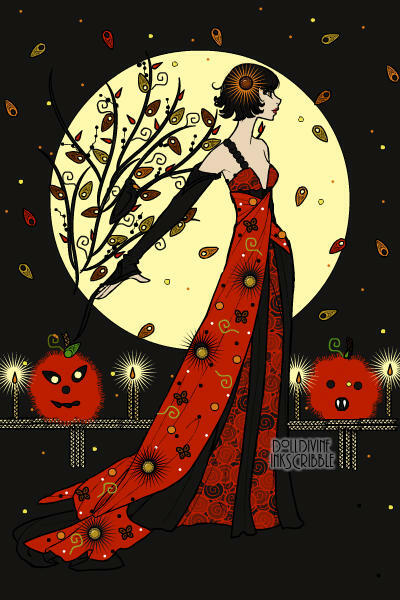 The leaves and dots in the air make it wonderfully the idea of the wind, the pumpkins are delicious and the candles are spectacular! Her beautiful dress, looks like a costume princess of vampires! Congrats ....You have won 3rd place in my "Is it fall yet" contest!!!!! I have always loved this one! It is sooooo "fall~ish"! oh i won the autumn contest thankyou very much!. our family has a fun halloween tradition, we give out candy, but we also make 'SPIDERDOGS' and give out pop and juice, to the neighbourhood. what is a spiderdog you may ask...a hot dog that i cut at each end to make 4 'legs' then you bbq the dog till the les curl up. then stick a long lollypop sick into the 'body' of the 'spider' voila! yummy spiderdogs! we are fast becoming THE house to trick or treat at, so fun to see the smiling kids !